Home › Uncategorized › Do gut microbes shape our evolution? As this schematic illustrates, we all have microbes in our guts: our microbiota. Michael Shapira proposes that not all microbes are the same. Some, core microbes, are important for our existence and evolution, and may even be passed down to our offspring. In addition, a flexible pool of microbes — members of which can be exchanged with similar microbes in the environment — is available to assist our survival and adaptation in the face of environmental changes. Scientists increasingly realize the importance of gut and other microbes to our health and well-being, but one University of California, Berkeley, biologist is asking whether these microbes – our microbiota – might also have played a role in shaping who we are by steering evolution. Biologists have gathered evidence that the interdependence between animals and their symbionts – the organisms, typically bacteria, that live in or on them – has consequences for the evolution of both. But Michael Shapira, a UC Berkeley assistant professor of integrative biology, believes that the diverse microbial communities that we harbor have a more profound effect, significantly ratcheting up evolution in an intimate collaboration for survival. 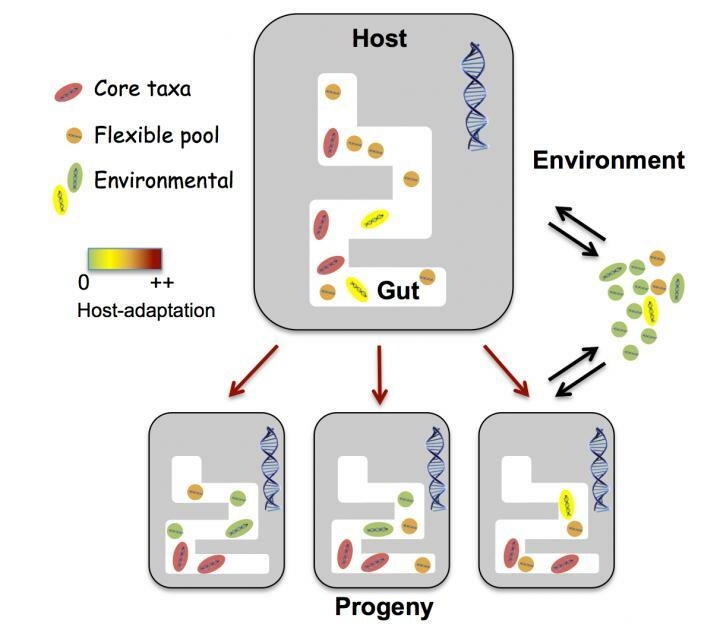 In a recent paper in the journal Trends in Ecology and Evolution, Shapira, who studies the gut microbes of the nematode C. elegans, reviews evidence that demonstrates how microbiotas affect and contribute to host evolution, either by evolving along with the host, or by stepping in at critical moments to help the host adapt to a new environmental challenge. Researchers examining the genes of different species of aphids and of their individual gut bacteria found that the emergence of new species of aphids during evolution was mirrored by speciation events in the insects’ Buchnera symbionts. This demonstrates how the linked fates of the two species lead to co-evolution. But Buchnera are not alone. Subsequent work showed that aphids also harbor other symbionts that are less important for, or dependent on, their host, but nevertheless help the insects adapt to new niches in a changing environment.